There was nothing easy like Sunday morning in the Campo Marte for the Longines Global Champions Tour show in the heart of Mexico City. 34 top class riders scorched round the 1.50m speed class and it was the in-form Pius Schwizer (SUI) who took top honours, securing a sensational second victory of the show with the 11-year-old gelding Balou Rubin R.
The blistering sun shone bright once again for the fourth and final day for the LGCT and, after all the excitement of yesterday’s GCL victory for the Miami Celtics and Scott Brash’s triumphant return in the LGCT Grand Prix, there was no let up in the pace as 34 elite riders returned for more high-octane action. This speed class’s twists and turns challenged riders from the outset and made for an enthralling spectacle. 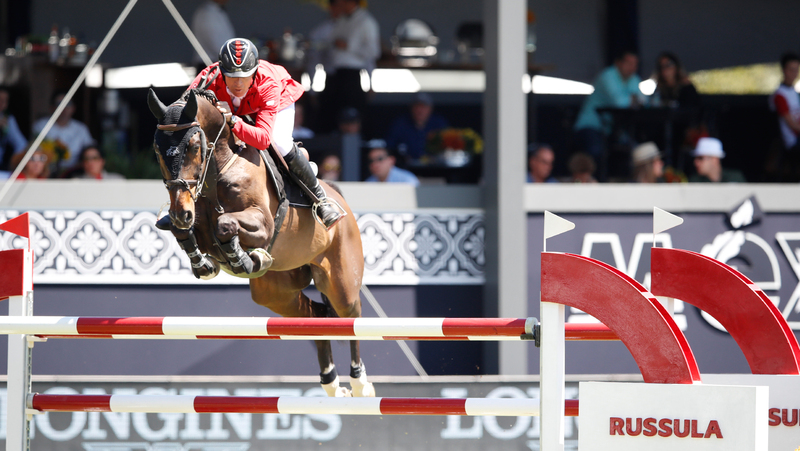 Rocketing into the lead was Shane Sweetnam (IRL), who is enjoying a super show in Mexico, winning Friday’s two-phase with Cyklon. The pair returned once again to lay down the gauntlet of a clear in 54.99s in this one round class against the clock. His fellow countryman Darragh Kenny’s brave challenge with Team De Coquerie in 55.71s slotted him into second and for a while Ireland held an impressive one-two on the leader board. But Pius Schwizer has already made a determined start to the 2018 LGCT season, winning Saturday’s LGCT Grand Prix qualifier, and the Swiss rider returned this morning to sail into a strong lead of 54.34s with some daring inside turns. Despite some of the fastest riders on the circuit following in hot pursuit, Pius held the mantle and a resounding victory was his. The excitement revs up even further this afternoon as the LGCT of Mexico City concludes with the 1.55m jump-off class. Who will claim the final victory of this dazzling show? Tune in shortly to find out.